Ultra Tech Enterprises | Railroad Testing Equipment | Quality Assurance Welcome to Ultra-Tech Enterprises, a Railroad Testing Equipment Provider in Punta Gorda, Florida . 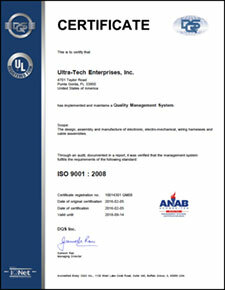 Ultra-Tech Enterprises, Inc. (UTE) is now certified as an ISO 9001:2008 compliant organization. The ISO 9000 systems standards are designed to help organizations ensure that they meet the needs of customers and other stakeholders while meeting statutory and regulatory requirements related to a product. We have noted the significance of this certification to a company like Ultra-Tech which is comprehensively involved in the research and development of special test systems and hardware/software solutions for the railway industry. UTE is a specialized engineering, manufacturing and service company, with primary products being on-board and portable test equipment/systems for public and private railroads, transit operating authorities, including freight and passenger services, and rail car builders across North America. Ultra-Tech is uniquely able to provide turn-key solutions from initial product design to manufacturing to training and continued servicing. Ultra-Tech Enterprises Corporate Quality Policy is aimed at total customer satisfaction. ULTRA-TECH'S GOAL is to make our customers successful in a manner that reflects a total commitment to produce and provide products and services of the highest quality. Quality Assurance, therefore has the full support of top management to maintain the highest standards of quality and constantly strive to improve the system in all phases of operation to achieve this quality level. Ultra-Tech assures the quality of all our products and services through implementation of a Quality System. responsible for implementation in accordance with Ultra-Tech's Quality System and will provide cost effective and positive corrective action on problems related to product quality, product engineering, and delivery. As President of Ultra-Tech, undersigned below agrees and will support the policies and procedures laid forth within our Quality System.